I did not know quite what to expect from The Duke’s new flagship production ‘Blackout’, but from the level of promotion that it had received and its uniquely local subject matter, I suspected it was to be something special. And I was not wrong. The play revolves around the tales of various residents of the Lancaster district, and how they were affected by the floods caused by Storm Desmond. The true stories are performed by a mostly community cast, playing other residents of the community, and this element makes it truly heart-warming and gives you a real sense of belonging to live within this city. The staging was a particular highlight for me. The rain mysteriously represented by the sound of marbles running along a track, paired with darkness and flashing lights during the set changes, created an effective air of disaster and horror that residents were faced with. The audience initially walk into a darkly-lit, macabre knock-up of a Lancaster street; setting the scene perfectly for the dark comings. However, the production boldly began with a mock lecture about electricity, delivered by one of the leads, Paul (played by Peter Rylands). Quirky and humorous; this was a genius idea to inject some laughter, and to establish one of the sets of characters that lead the play. Paul is the Father of the middle-class Lancaster family, one of the many affected by the floods. However, their story is mostly centred around son Jack, superbly played by Tristan Grant, who goes to boarding school during the week and returns home at the weekend. The dynamic of this family is realistic and the strains that the floods put upon their relationship are felt by the audience. Another focus of the play is teenager Chloe, who resides in Morecambe council housing, but is stranded in Lancaster centre after the floods cancel her bus home. She is also perfectly portrayed. As an angsty teenager who mostly internalises her feelings, the floods enable her to reconsider what she has in life and connect with lost associates. I found her portrayal difficult to watch at times, due to its pure realism- it shone a light on sociopolitical issues that exist in Lancaster outside of the Storm Desmond, that need radical improvement. The final story came from Angela (played by Christine Mackie), one that I found less affected by. She owned a shop selling baby products in Lancaster that flooded, forcing her to close. Whilst this situation is undeniably horrifying, her portrayal seemed smug to me. It always seemed as if she was an actor playing a role, and never a true citizen properly amongst the storm. I struggled to find emotion in her performance and she never really connected with the audience. Perhaps this was because she stood out as one of the only two professional actors, starring alongside the rest of the community cast, therefore, seeming as overacting. Whatever the cause, I think a full community cast would have further driven the locality and emotion of the play home. 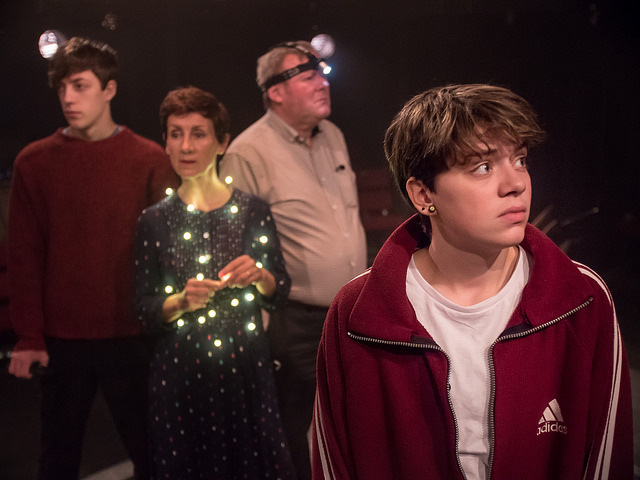 Overall, Blackout is a brilliant success which sensitively deals with the disasters of Storm Desmond, whilst creating a thoroughly entertaining production. Provoking an audience response filled with such high levels of pride and emotion is not an easy task- but one that Blackout achieves so easily. Blackout runs until 3rd November at The Dukes. Previous articleOlympic Karate: A positive or negative for the sport?